A special platter just for you! Perfect for upscale casual entertaining, use on boats, backyards, picnics and more. Enjoy a 14" x 10" oval platter made from non-breakable melamine and personalized with your choice of monogram, single initial or three short lines of text. Personalization in your choice of ink color. This item is food-safe and dishwasher safe. Do not use in microwave. The melamine product is non-toxic, BPA-free and is proudly made in the US plus all materials and components are from the US. 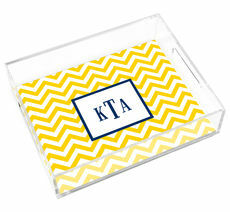 Sample shown with Classic monogram, Navy ink and Navy accent color.